No matter what one has thought about Amaranthe and their metallic approach, it’s easy to say that they’ve always forged ahead with their own path and done exactly what they wanted to do, sometimes throwing the rulebook completely out the window. Such an attitude lead to 2016’s Maximalism, a release that polarized some due to its exploration of ‘non-metal’ elements and a decrease in heaviness overall. 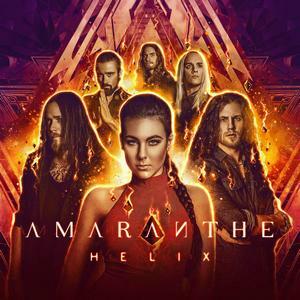 Couple that with clean male vocalist Jake E’s announcement that he was leaving the band in early 2017, there was definitely a portion of the Amaranthe fanbase that was concerned about the future direction of the rising modern metal act. Now that the ship has settled back down with the enlisting of Dynazty’s Nils Molin, Helix serves as yet another excellent step forward for the band. The first thing to state about Helix is that those upset by the ‘heaviness factor’ of Maximalism should rest easy. Growler Henrik Englund Wilhelmsson gets to show more personality and attitude than seen on previous releases, and Nils Molin’s range lends itself well to some more aggressive moments and serves as a different but equally compelling complement to Elize Ryd’s always poignant vocals. This new combination sees the band reclaiming a bit of the punch of earlier releases. “Iconic” is about as close to straight melodeath as the band has come, with a distinctly Soilwork-vibe in it’s fury and circle-pit friendly riffing. “GG6” opens with a monstrous breakdown and sees Wilhelmsson doing some ‘death-rapping’ to some “Fury”-esque vocals (from a lyrical standpoint) that surprisingly works, sitting atop some of the chunkiest grooves the band has done. Even the one ballad this time around, “Unified,” throws a curveball and sees Molin taking more of a lead role at its onset and digs further into heavier territory than some previous ballads. Aggressive increases aside, Helix still highlights what has always made Amaranthe stand out, as well as continuing to flesh out the electronic aspects that Maximalism augmented. Songs like “Inferno” and “Countdown” take a page from the band’s classic sound and are sure to be favored live tracks with their fusion of electronic and metallic elements. “Breakthrough Starshot” pushes the interconnection with dance beats and driving riffs to an even more futuristic vibe, and closer “Momentum” has a suitably epic feeling to it that begs the album to be repeated. Just like with previous efforts, and already alluded to, even with a new vocalist in the mix it appears the 3-vocalist balancing act is even stronger (perfectly embodied in “My Haven”). Ryd has her stamp on each track for sure in glowing and radiant choruses (the title track and “Dream” provide some jawdropper moments), but Wilhelmsson has clearly found his own role and gives the heavier moments more urgency and vitality, with Molin quickly establishing his niche in ability to switch things up between beauty and beast. Lastly, Olof Mörck continues to lean into the subtle yet impressive guitarwork, bringing things to the center when necessary but without being overtly flashy, and surrounding himself with a strong rhythm section. Just when you think Amaranthe has hit their creative zenith, they go ahead and up the ante once more. Tightening things up on the heavier side, while maintaining the more experimental electronic elements makes the album both addictive and perhaps deeper than one might initially expect. Sure to get even some of the most jaded metal fans to smile and break a leg, all while providing the substance that they require to fully appreciate it from a musical standpoint. Helix pushes boundaries while Amaranthe continue to define what modern metal is all about.